Parts obsolescence is a real issue in high-reliability electronics like aerospace and defense systems. Uncle Sam spends $10B per year managing and mitigating electronics obsolescence issues according to an April 2008 article in the IEEE Spectrum. It's a tough job, but someone has to keep track of where all the dead nameplates of microwaves go. And that's us! Why is this little bit of history important? Picture this: you need to find replacement parts for receiver that used custom Q-bit amplifiers that you paid big bucks for back in 1990-whatever. Q-bit doesn't exist. What would you rather do, reinvent the wheel, or track down the company that inherited all of their drawings? We present an alphabetized list of dead microwave nameplates below. Audience participation is important to building the database, most of the content was contributed one or two companies at a time by alert readers. Any new info or corrections that anyone has, please send it in and we'll add it to the list. Our policy is NOT to put contact info for these companies, unless they throw us some cash! We take zero responsibility for the accuracy of the info on this page (or any of the opinions for that matter), it is for your amusement only, don't reference it when you are on Who Wants to be a Millionaire! Here is a site that shows the background of the various top tier defense contractors. We are more interested in components here at Microwaves101, so we won't try to master the topic of which companies make up LockMart, Boeing, GD, etc. Mergers and aquisitions are sometimes a mess. When two companies merge, there is always some resentment and sometimes it is not misplaced. Read about the Cinderella Effect on Wikipedia.Just ask anyone that was at TriQuint when they merged with RFMD, or someone that was at Texas Intruments when Raytheon acquired them. Then give them this advice: get over it! Here's some questions that readers have asked... if you know, clue us in! What is the story with PRD (Polytechnic Research and Development)? Among other things, they made variable vane attenuators. Now on to our growing list! Acrian was started by some folks from CTC, including me, in 1978. We acquired CTC in 1981 from Varian. Company closed in 1991, assets and technology sold to both Ericcson and GHz Technology. UK-based aerospace technology developer Cobham plc has completed its planned divestment of M/A-COM’s commercial division, now named M/A-COM Technology Solutions Inc (MTS), for up to $90M. The transaction excludes cash and the freehold of the Walker Building in Lowell, MA, USA (valued at $10M). Founded in 2004, Auriga Measurement Systems (Lowell MA) united Agilent Technologies' high-profile east coast Component Test Systems group and ACCO USA's modeling and characterization teams. Addington Laboratories is listed as one of Crane A&E's heritage brands. AEL (American Electronic Laboratories, Inc.) of Colmar, Pennsylvania, maker of antennas, microwave components, solid state devices and microwave instruments was founded in 1950. AEL is is now part of Cobham Landsdale (Pennsylvania). First sold to Tracor in 1996, AEL later became part of BAE Systems and was most recently bought by Cobham in 2008. AEP is now a Radiall Company. Ben Travelli made arrangements to sell AEP to Radiall, just before he passed away in 2005. Thanks, Greg! Aeroflex was aquired by Cobham in September 2014 in a deal valued at $1.46B. Aertech was founded in the late 1950s or early 60s by Fred Schumacher and Harold Harrison and became TRW Microwave in 1974 (we believe). Here is a site created by Brooke Clark that gives a detailed history of Aertech. Aertech had a large lot, on which stood a building that Signetics rented, the old building (building 1), a new 2-story building (building 2, later on the company shrunk into this), and a third one, with stores in it, among others, De La Cruz Deli... If you walked across the parking lot between the buildings, it seemed convenient to stop by for a beer or to play a little pool during working hours! As Aertech did not have a paging system, and if I could not find someone by phone in either building, I'd check the deli also. AIL (Airborne Instruments Laboratories) had merged with EDO and has since sold to ITT who in turn renamed as ITT Exelis, then again as just Exelis. Exelis was purchased by Harris in May of 2015. AIL used to be in Deer Park, NY and has relocated a few miles away to Amityville, NY. Yep, the same town as the Amityville Horror house. Thanks, Marian! Alford manufacturing were taken over by Teleplex Inc in 1991. Things seemed to get a little messy going by the google hits about court cases. I can't find much about Teleplex online but it would appear that they are now Broadcast Services Inc. operating from Indianapolis. I did, however, find a web reference to an Alford division in Mass but can't track anything down. I find it all rather sad actually - so much technology and expertise just disappeared. Here's one link if anyone wants to dive down the rabbit hole and look for more info in Alford. Alpha Industries is part of Skyworks. Alpha Industries sold off its commercial millimeter products group which became Advanced Frequency Products (AFP). Advanced Frequency Products was bought by ST Olektron. ST sold off the AFP group to Endwave. What was once American Electronic Laboratories (AEL Industries) is now part of BAE we have heard. Americon Microwave Industries, a manufacturer of microwave connectors and components, merged with Omni-Spectra in the 70's and the founder and CEO of Americon, Bevin V. Cherot became the CEO of Omni Spectra until purchased by M/A-Com. Thanks to Brian! Anaren made an offer to acquire AML Communications in early 2011. However, Microsemi came in a month later and made a better offer, and AML Communications was sold to Microsemi. Anaren is a separate company and is not related to or part of Microsemi. Thanks to Tim! Amplica of Newbury Park, CA was originally bought by Comsat, then by Triax, and finally by Charter Technologies before it was dismembered and scattered to the winds. Some of the original significant technical talent and founders are now involved with CAP Wireless, Inc. also in Newbury Park, CA. Thanks for the update, Scott! According to the US Government CAGE lookup table, at some point, Amplica was doing business as Amplifier Acquisition Corp. (or vice-versa), but that's a story for another day! Amplifonix (Philadelphia, PA) is part of Spectrum Microwave. As of March 16, 2016, Anadigics was acquired by II-VI Incorporated. The six-inch GaAs fab will be re-purposed for vertical-cavity surface-emitting lasers (VCSELs) apparently. Anzac became part of M/A-COM, which was bought by AMP, which is now part of Tyco. This is very old: ARCO was Applied Radiation Corporation (Walnut Creek, CA), a manufacturer of microwave linear accelerators and high power microwave waveguide elements (pulse modulators, waveguide couplers, adapters, windows, tuners, etc.) became the ARCO Division of High Voltage Engineering (c. 1965), and was later sold (c. 1970) to Siemens Medical Systems (Concord, CA). Thanks Dennis! Applied Wave Research was bought by National Instruments in July 2011 for $58M. Arcom was bought by Dover and then closed. LNX Corporation bought the assets from Dover and they are now making products that Alpha (Skyworks) and others no longer make. Thanks, Philip! Atlantic Microwave Corporation is part of Cobham DES. However, Atlantic Microwave Limited - an RF & microwave component manufacturer and distributor with headquarters in Essex, UK is a privately owned limited company. Thanks to Paul for providing this important distinction. Avantek was purchased by H-P Semiconductor, which became part of Agilent. As of December 2005, the Avantek division of HP that spun off to Agilent Technologies was sold and morphed into Avago. Got that? Some of the Avantek road kill was picked up by the microwave design scavengers at Avnet... Teledyne (via Teledyne Cougar) bought the assets of Avnet-MTS (MTS meaning "microwave technical solutions") late in October 2005. Believe it or not, you may actually be able to buy that Avantek amp from Cougar. If Cougar doesn't sell it or a replacement part, they actually stock a fair amount of the old Avantek die, according to insiders. "Once Avantek started to vanish, there were a couple spinoffs. DBS Microwave and Milliwave Technologies. DBS sold itself to Narda Microwave, the founders got rich, the employees got "thank you". Narda then consolidated DBS into their Narda West operation in Folsom. In doing so a lot of DBS employees were released. Other spinoffs from DBS and Milliwave are ALC Microwave, Aldetec and Phase One Microwave. ALC is in El Dorado Hills and seem to be doing well. Aldetec is in Sacramento and they also are doing well. Phase One is in Rocklin and they are surviving but their management is too young and inexperienced. Another Avantek spinoff is Genesis Microwave in El Dorado Hills. A chunk of Avantek that survived the HP acquisition which was then sold to Powerwave Technologies just recently had it's doors closed. ~20 or so old Avantek workers now find themselves without a job. A previous layoff off of Powerwave engineers (ex-Avantek also) formed a consulting firm called Telemakus LLC. Milliwave sold itself to TRW Space and Electronics Group, and stayed in Diamond Springs. TRW subsequently sold them to Endgate Corporation, then the combined operation then became Endwave. Manufacturing remained in Diamond Springs, but all engineering, sales and marketing went to Sunnyvale. The founders of Milliwave are now founders of Norden Millimeter located in Placerville, CA. The saga continues for the old Avantekers. ALC Microwave was recently purchased by Endwave. Then Endwave merged their Diamond Springs facility and the ALC Microwave group from El Dorado Hills into a new facility back in Folsom near the old Avantek building. Last week, it was announced this division (Def & Security) of Endwave is now sold to Microsemi. The result is Endwave is now back to just being the old Endgate company. In June 2007, AVX announced its intention to acquire American Technical Ceramics. AWR was bought by National Instruments in 2011. Bell Labs, originally the research arm of AT&T and boasting "a patent a day", became part of Alcatel in the 1990s. In 2015 it was sold to Nokia. Balo: who knows where Ed Raposa is, but the "Raptek" housing company of beautiful Butler New Jersey is long gone! See Bomac's historical ads on this page, they are a riot! Celeritek Semiconductor was bought by Mimix Broadband in 2005, Mimix kept the product line, and later sold the Celeritek GaAs fab to Universal Semiconductor Technology, Inc. (USTI). Celeritek Defense Group was sold to Teledyne Microwave and relocated from Santa Clara to Mountain View. Thanks to Mark! Central Microwave Company (CMC) of St. Charles, MO built primarily Gunn diode based products and later some FET amplifiers. CMC was formed by Jim & Dee Caldwell, Dr. Robert Goldwasser, Dr. Fred Rosenbaum (both of Washington University, St. Louis), William Meyers, and Darrel Bengfort. Most had met while working for Varian. CMC was sold to Alpha Industries around 1982. Owners got rich, employees got thank you. CMC moved to Maryland Heights, MO around 1984. Around 1989 (recall aerospace cutbacks) work was pulled back to the mothership in Woburn MA and the CMC facility was shuttered. Thanks to Bobby for the input! Channel Microwaves Corp., designer and manufacturer of passive isolators/circulators, was acquired by Smiths/TRAK microwave in 2009. TRAK dropped the Channel name and stopped supporting Channel products in 2013. When that happened, the core engineering/management team on the Channel products joined M Wave Design (Simi Valley, California) to support the displaced Channel work. Codan’s Satcom Group was sold to CPI in May 2012. Thanks to Graham! Communications Transistor Corp. (CTC) was a Varian funded startup in the late '60's started by some folks from Fairchild. Absorbed by Varian in 1975 and sold to Acrian in 1981. Thanks to Lyle! Compact Software is part of Ansoft. Connecting Devices Inc. (CDI) was bought by Tensolite. Conexant is part of Skyworks. Conexant (previously Rockwell International) spun off the GaAs (Newbury Park) portion of the fab to Skyworks (previously Alpha Industries) and the other fabs became Jazz Semiconductor. Jazz merged with Tower in September 2008 and is now called TowerJazz. Tower was a National Semiconductor spinoff. TowerJazz is headquartered in Israel and publicly traded on NASDAQ and the Tel Aviv Stock Exchange. Continental Microwave and Tool was acquired by Chelton, which is now part of Cobham DES. Cougar Components was bought by Teledyne in June 2005. Crane Aerospace and Engineering claims a whole slew of heritage brands: Merrimac, Signal Technology, Olektron, Microsonics, Western Microwave, Innowave, Omni Spectra, Addington Laboratories, and Varian Solid State Microwave. Thanks to Keith for pointing this out! Cree's RF group spun out in 2015 and is now Wolfspeed. Whoops, make that Infineon as of July 2016. AND now they're back home, as Cree purchased Infineon in March of 2018. CSF (Compagnie Générale de Télégraphie Sans Fil) was merged with Thompson in 1968. Today Thompson CSF is part of Thales. CTI (Communication Techniques Inc.) was part of the Dover Corporation group of companies until Dover sold this division to Herley Industries. Herley were then acquired by Kratos Defence in 2011. In 2015 the British defence company Ultra Electronics bought Kratos Defence and in the process acquired Herley – CTI. In 2016 the CTI name disappeared being replaced by Ultra Electronics Herley. Delta Microwave (Oxnard, CA) joined Mercury Systems in April 2017 for $40.5M. This info on the whereabouts of Dexcel and other companies is courtesy of George, with some edits by other contributors. "Dexcel (an early GaAs MESFET company) was bought by Gould in 1985. Dexcel/ Gould was later bought by Litton Solid State, who bought out Harris Microwave in Milipitas and Varian Semiconductors in Santa Clara. Later, Litton Solid State became Filtronic Solid State in the 1990s. In 2004, Teledyne Microwave bought the military operations of both Filtronic Solid State and Celeritek. Filtronic S.S. kept the semiconductor / fab technology while Mimix Broadband bought Celeriteks semiconductor operations (which have since been sold!) Teledyne Microwave can help with legacy products of Dexcel/ Gould as well as Filtronic Solid State and Celeritek. By the way, not only is the old Hyletronics part of Teledyne, and Ferretec is as well. Teledyne also bought KW Microwave (April 2006) and Cougar Corp of Sunnyvale in June 2005." What happened to Demornay-Bonardi? The answer comes from Ken: The rights to the Demornay-Bonardi product line were bought by Systron-Donner. In 1991 when I needed D-B parts, Systron-Donner was the vendor. I do not know for sure if there was/were (an) intermediary owner(s) between the original dB and Systron-Donner. When Systron-Donner had the line, all the standard gain horn model numbers were the old dB numbers. Systron Donner sold the rights to dB to STC Microwave Systems, which is a division of Crane Aerospace and Electronics. I don't know if STC Microwave was part of Crane when the dB acquisition occurred. STC Microwave in turn sold the rights to the Demornay-Bonardi product line to Penn Engineering, which substituted all new model numbers for the horns, but they are the same old dB parts. Thanks Ken! Ducommun LarBarge's history is traced out below, thanks to Rich. We wish we had more diagrams like this! EDO Corporation dates back to 1925, and is named after Earl Dodge Osborn. After WWII they became known for C4 and EW systems such as ALQ99 (a jammer). In 2007 EDO was bought by ITT for $1.7B, which spun out with other operations in 2011 as Exelis. Recent problems with programs have cause Exelis to close the EDO plant in Thousand Oaks, and fire their executive vice president ("retirement" is how they put it in the press release). EEsof was another sort of spin-off of Amplica, by Bill Childs and Chuck Abranson about 1983. EEsof was acquired by HP in 1993 and later spun out as part of Agilent in 1999 thus becoming Agilent EEsof EDA. Octavius Pitzalis, one of the EEsof team and one hell of a nice guy, was killed years ago driving his sports car. EEV: "English Electric Valve" was part of Marconi for a while, and is now an independent company called E2V, since 2002. Thanks, Brian! In 1999 The corporate board bought Perkin Elmer Instrumentation and after selling off the Defense contracts, the original name and the original logo to the Carlyle Group the hid the identity of the original company under the Perkin Elmer flag. (Similar to Allied signal becoming Honeywell after Allied Signal bought Honeywell). In August of 2002 the Carlyle group sold off the defense and technical services of EG&G to the URS Corporation. The use of EG&G name and logo continued until January 2010 when use of all secondary logos stopped. The manufacture of the spark gaps, thyratrons (such as the HY5 and HY10) flash tubes and pulsed transformers (the original equipment that made EG&G ) continued with the Perkin Elmer logo. In November 2010 the portion of the company that made these high voltage products was spun out as a separate company now named/called Exceliates Technologies. They are still in the same plant. EIP Microwave used to make the frequency counters that you'd need because "sweepers" drifted all over the place (before "synthesizers" were available). EIP Microwave went out of business in 1998, their assets were purchased by two employees and they re-emerged as Phase Matrix, which is now a subsidiary of National Instruments since 2011. Thanks to Steve! EMF Systems (known for good DROs) got bought by Spectrum Microwave, State College, PA. Spectrum has massively increased the size of the complex and added clean room and hardboard capabilities. Rumor has it that work is being moved from Palm Bay, FL and Philadelphia, PA to this new facility in State College, PA... thanks to Gene! This entry came in from Patrick... Thanks! EMI Varian (1969 Microwave Tube joint venture between EMI and Varian) became Thorn EMI Varian in 1979 when Thorn merged with EMI. The JV with Varian was allowed to lapse in 1989 and the remaining UK company became Thorn Microwave Devices Ltd a subsidiary of Thorn EMI Electronics. As part of Sir Colin Southgate's grand plan to increase shareholder value by making the company smaller, the Defence Electronics businesses were disposing of and eventually the Microwave Tube business (which by then was also making complete amplifiers and high voltage power supplies) was bought by its management becoming TMD Technologies LTD in 1995. Unsurprisingly freed from corporate interference the company has grown and prospered since then and is still manufacturing magnetrons, klystrons traveling wave tubes and high voltage power supplies. This info on ESC came from Carl-Friedrich. Thanks! You say someone is looking for info on Electronic Surveillance Company (ESC), in regards to a Gunn oscillator. The latter is called ESC Electronics Corp. It was good in delay lines, but also had other canned devices (as filters etc.). I could imagine a Gunn oscillator would better suit this company than the Canadian. I believe the company is still alive but inactive. Electro-Films was acquired by Vishay in 2000. This info thanks to Bob: Electromagnetic Sciences, Inc., a spin-off from Scientific Atlanta in 1968 producing low loss ferrite circulators, isolators, and switches for space applications. Name changed into EMS Technologies, Inc. in 1999 (reckon that was easier to say than "electromagnetic sciences."). EMS Technologies, formerly Electromagnetic Sciences, was purchased in August 2011 by Honeywell. The ferrite components and antenna systems groups are now part of Honeywell Aerospace. Endwave sold off their defense and security business to Microsemi in April 2009. The rest of Endwave has recently “merged” with Gigoptics with the suspicion that the Endwave name will cease to be used. Thanks to Liam! Update 2018:Gigoptics was purchased by Integrated Device Technologies (IDT) in 2017 for 200m, and then IDT was bought out by Tokyo-based Renesas in 2018. Engelmann Microwave is now part of KDI/Aeroflex. Thanks, JJ! Enon Microwave Inc. of Topsfield MA has been folded into Micronetics since 2002. Whoops, it is now part of Mercury Systems! Eudyna is said “you-deen-ah” if you are Japanese or worked for a Japanese company. By American or British pronunciation rules it should be “You-dine-ah”. Fujitsu Compound Semiconductor Inc (FCSI) which was a division of Fujitsu, was sold to Sumitomo Electric. Being Japanese companies, they do things differently. First a joint venture was created in 2004, 50/50 owned, which ran for five years as Eudyna. Eudyna was about 50% microwave devices and 50% lightwave devices in mostly Gallium Arsenide. Fortuitously, Fujitsu developed the world’s best Gallium Nitride, which became an important product for Eudyna. At the end of 5 years, Sumitomo Electric exercised their options to buy the rest of Eudyna from Fujitsu. Within months, Eudyna was a memory, everything went from Fujitsu red to Sumitomo Electric blue and the company became Sumitomo Electric Device Innovations (SEDI). The US sales branch is Sumitomo Electric Device Innovations USA Inc, or SEDU. Most of the FCSI parts are still being made by the same people at the same factory now labeled SEDI. Plus a whole bunch of Gallium Nitride parts from the Eudyna days. The sales team sits at the same desks and sells the same stuff. SEDI actually grew, a Sumitomo company called Excelite was combined in with Eudyna as part of SEDI. Excelite only made lightwave parts, so most of SEDI is now lightwave devices and subsystems. In any case, FCSI and Eudyna microwave parts are mostly still available from SEDU. Or a replacement part (usually). SEDI (former Eudyna former FCSI) is the world leader in Gallium Nitride parts, below 3.5 GHz they have sold most of the world’s GaN. Above 3.5 GHz is another story, but that market is still fairly small. 2513 Charleston Rd. Mountain View, CA - They developed the first multiplier/amplifier used for the Bell system "thin route" telephone. The group was funded by Bob Noyce and Gordon Moore to develop microwave technology with the Fairchild transistors. The patented multiplier developed by Gene Guthrie was used in the California Microwave CM41 which retrofit all of the Backward Wave Oscillators ( BWO ) in the Bell System. The Fairchild group moved to a new building at 3500 Deer Creek rd. in Palo Alto. This business was eventually bought by HP and the products later sold to Narda which is now L-3. The Deer Creek building is now the corporate office for Tesla Motors. Farinon Electric was bought by Harris Corporation in 1981. Part of the company was bought out to form M2 Global in 1999. Part of FEI Microwave was bought by STC Microwave Systems, a part of Crane Corporation. This was the old TWR Microwave and much of the microwave/hybrid group was moved to FEI (Frequency Electronics Inc.) in Mitchell Field, NY. Ferretec was originally sold to Litton Solid State, then Litton Solid State was sold to Teledyne Microwave and relocated from Santa Clara to Mountain View. Thanks to Mark! Film Microelectronics Inc. (FMI) was acquired by SatCon Electronics, back in 1997. But wait, there's more info, thanks to Alan: FMI it is now part of API Technologies. API absorbed Spectrum Microwave, FMI/SatCon, Micronetworks, and a few others. Filtronic Compound Semiconductors is now part of RFMD. Frequency Sources (FSI) became part of Loral. Their Chelmsford facility is a Superfund site! When owned by Loral, the source division of Frequency Sources was called: “Loral Microwave-FSI,” and after Lockheed-Martin bought Loral, it merged with Lockheed-Sanders, or tried to at least. When Lockheed-Martin sold off Sanders, they kept the FSI operation and merged it with Missiles and Fire Control Division whom they support to this day. The diode operation (GHz Devices) is now part of Microsemi in Lowell, MA. For a time in the 70’s, the Chelmsford Water Commissioner was also the QA manager at FSI. FSY Microwave (Columbia, MD) is part of Spectrum Microwave. Whilst FXR were definitely in Woodside, NY in the early sixties they were definitely part of Microlab/FXR by 1966 (Source: the Microwave Engineers Handbook and Buyers Guide 1966 - yes, I have been around that long!. In an ad in the book it quotes "Microlab/FXR - the combination of Microlab, Bogart and FXR". At this stage they were in Livingston, NJ. In 2001 they were taken over by Wireless Telecom Group. The name has now been shortened to Microlab with no sign of FXR on the website or the catalog (except for a little bit of the history of WTG). Strangely, the website is fxr.com! They are now in Parsippany, NJ. Most of the old legacy products have also disappeared. Fujitsu Compound Semiconductor was a part of Eudyna for a while. General Microwave (Long Island) has been part of Herley since 1999. General Microcircuits Corporation (GMC) is also part of Herley, but the Billerica Massachusetts facility was sold to Solid State Testing (SST). GHz Technology was started in 1991 after the demise of Acrian (I was a principal). Sold to Advanced Power Technology which was subsequently sold to Microsemi. According to Lyle. Gigoptics bought Endwave in 2011. GigOptix moved into the old Endwave building in Sunnyvale, then renamed themselves to GigPeak. They struggled for a few years then when business picked up slightly, GigPeak was bought by Integrated Device Technologies (IDT) in 2017 for 200m, and closed and sold the old Endwave building and moved to South San Jose. IDT was bought out by Tokyo-based Renesas in 2018. Gilbert, the original inventors of those tiny push-on connectors known as GPO, is part of Corning. Grayzel was bought by Adams-Russell (M/A-COM). Harris Microwave Semiconductor (a GaAs fab) was bought by Samsung around 1993, for a paltry $5M. Samsung kept it until about 1998 when they sold it to Watkins Johnson and it folded into their semiconductor business unit. Thanks to JC! Harris sold its silicon fab to Intersil, in 1999. Thanks to Tony for pointing this out! HE Microwave, one piece of the Hughes Aircraft Company, became part of Raytheon after the 1997 merger, shared with Delphi Delco Electronic Systems. Not long after Raytheon shuttered this Tucson facility, what was left over became part of the other parent and moved south of the border. Herley Industries was acquired by Kratos Defense & Security Solutions (San Diego, CA) in 2011. The Herley companies (Herley New England (formerly MDI), Herley Lancaster, Herley CTI and Herley New York (formerly General Microwave)) now form the Kratos Electronics Products Division. Thanks to Ralph! Hewlett Packard: the "good part" spun off as Agilent to make test equipment and lose money, while the HP name survives as a purveyor of crappy computers and printers. Hill Engineering (Topsfield MA) was acquired by Comtech PST in 2001 (http://comtechpst.com/hill/AboutUs.aspx). Thanks to Joe! HRB Singer State College, Pa and Reston, Virginia. Circa 1979 Receiver design engineers migrated to SciComm's COMINT Receiver group located at 2929 Eskridge Road, Fairfax, Virginia. (parent company SciComm Inc aka SCI Garland, Texas operated SIGANT product facility in Garland just a few miles from Dallas). COMINT operations grew rapidly from 1979 to 1983. In 1983 California Microwave bought SciComm Comint Operation in Fairfax, VA, designated the Fairfax operation the Communications Receiver Operation and rebranded the equipment CalMic. In 1985 after several layoffs CalMic announced closure of the Fairfax plant, intellectual property was sold back to SciComm who took the residual operation back to Garland, Texas where the product line was produced following redesign. Subsequently SciComm was acquired by Andrews. Hughes Aircraft is now partly owned by Raytheon, partly by Boeing, partly by General Motors, with some other pieces scattered to smaller companies like Millitech and spin-offs such as DirectTV. Hughes Gallium Arsenide Operations in Torrence CA was quickly shuttered by Raytheon. This story came from "Twickey Wabbit" who has entered the witness protection plan. Way back around 1997, when Raytheon took over the Hughes missile factory in Tucson after years of rivalry, the president of the company came for a visit, stepping out of his bulletproof bunker in Lexington for final victory lap. One thing he was adamant about was that the name "Hughes" be painted over everywhere as quickly as possible, starting with the water tower, so the welcoming committee had to step lively. But outside the missile factory sits the Hughes Federal Credit Union, which had nothing to do with the merger. The president of Raytheon was rumored to have blown a gasket when he found out that he couldn't get them to change their name to "Raytheon Federal Credit Union" or some such. Not long after, the company petitioned the city of Tucson to change the name of the road that the missile factory is on, from "Hughes Access Road" to "anything but that hated name". Didn't happen. The Hughes Federal Credit Union still bears Howard's name proudly. And the IEEE gives out a medal bearing the name of the megalomaniac that wanted to stamp out the good name of Hughes. Where the heck is the Howard Hughes medal for engineers? Didn't Hughes' employees invent the laser? What did Dennis invent? This good news came in from Steve B: Hughes Aircraft in Carlsbad, CA , purveyor of Automated Wire Bonding and Die Attach systems became Palomar Technologies in 1995 and moved to Vista, CA down the road a few miles. The three legged stool (Y2K, Opto, Internet) led the company on a wild VC-induced goose-chase during the bubble of 99-01, but the company is back in Carlsbad again, and in 2006 Bruce Hueners became President and the company is powering on its own steam. The vast majority of hybrid and millimeter-wave folks have worked with this company in the past, even if they don't know it! The only pieces left of Howard Robard Hughes' empire that bear his name are the Hughes Network Systems, Hughes Medical Foundation and the Hughes Federal Credit Union. The "HRL" in HRL Laboratories officially doesn't stand for anything. HRH's 100 birthday was December 24, 2005. Hyletronics Corp. was first merged into Filtronic Solid State. They are now part of Teledyne Microwave. In their own words, "The acquisition of Hyletronics, through Filtronics Solid State, introduced a family of microwave switches into our product line. Teledyne Microwave uses these switches as key building blocks in many multifunction assemblies. " Inmet is part of Aeroflex. Innowave was bought by STC Microwave Systems, a part of Crane Corporation since 2003. Inter-Continental Microwave (ICM) is now part of C.E. Precision Assemblies, Inc. Founded by Werner Schuerch in Santa Clara, California, the products that ICM has made throughout the years can only be compared to Swiss watch or Swiss Army knife, but with much more attention paid to RF grounding! IntraDyne Systems spun out of Melabs in 1968, that died in 1970. Thanks to Ed! The ITT GaAsTek foundry in Roanoke VA was bought by M/A-COM, a part of Tyco. Oops, make that Cobham! This foundry closed in 2010, but has relocated to Blacksburg, VA. and has completed a fully functional transistor 99 days after shutting down the Roanoke fab. Congrats, and thanks, Bryan! Yes they did get back up and running quickly..but Cobham managed to send the message that they were closing and customers managed to find alternate sources. Revenue declined and Cobham closed the doors in September 2013. Thanks to Dan! ITT decomposed itself into four companies in in October 2011. The Defense and Information Solutions business is now called Exelis and is headquarted in McLean VA with a major site in Clifton NJ, and 21,000 employees. Ft. Wayne, IN is the larger facility but Clifton took over due to better politics. Other ITT-Exelis sites are being shut down to reduce competition with Clifton. Exelis became part of Harris on May 29, 2015. Rumor has it that Harris and L3 will merge in 2019. Click here to learn more about where other microwave nameplates are now. Jazz Semiconductor merged with Tower in September 2008 and is now called TowerJazz. Tower was a National Semiconductor spinoff. TowerJazz is headquartered in Israel and publicly traded on NASDAQ and the Tel Aviv Stock Exchange. JCA Technology (Jim Chao Associates) was originally sold to New Focus which eventually was acquired by Bookham. It was most recently sold to Endwave. Thanks for the corrections, Dave K! Wait, what's this? Ciao Wireless, a new company in Camarillo CA? Chao, Ciao? Yes, we get it now! Good luck, guys! Johnson Components, formerly E.F. Johnson Components, a manufacturer of microwave connectors and cable assemblies based in Waseca, MN was purchased by Emerson Connectivity Solutions, a division of Emerson Electric, in 2000. Thanks, Brian! KDI/Triangle is now part of Aeroflex. K&L Microwave is now owned by Dover Corporation. Speaking of Dover, some microwave-oriented companies that they now own include Dielectric Laboratories, Dow Key Microwave, Novacap, and Vectron International. kW Microwave was bought by Teledyne in April 2006. Lark RF Technology, known for RF filters, was bought by Secure Technology in 2013. Secure was acquired by Benchmark on Oct 22, 2015 for $230M. They are keeping the name "Lark" for now. Litton Airtron is part of Cobham DES. Locus Microwave (Pennsylvania) was acquired by Codan Limited (Australia) in 2009. More recentl,y Codan has been acquired by CPI International for up to $13.5M (May, 2012). Thanks to Graham! Litton Solid State is part of Filtronic. Litton Industries was eaten be Northrop Grumman. They spit out the pieces they didn't like and digested the rest into um... Northrop Grumman. Thanks, JJ! The first operating division of Litton Industries was its Tube Division. This was one of the pieces of Litton that Northrop Grumman found indigestible. They sold the entire Division to L-3 Communications (in 2003), and it is now known as the Electron Devices Division. But NG retained the rights to the Litton brand themselves. Thanks Neil! LNR Communications is now part of L3-Narda in Hauppauge, NY. Thanks, Marian! Logimetrics (a supplier of traveling wave tube amplifiers for lab work, of yore) was absorbed into IFI (Instruments For Industry). This thanks to Steve K. from WSMR! Steve spoke with a guy at IFI that confirmed several of the Logimetrics guys are there including him. He says they can evaluate and/or repair the Logimetrics amps. They also have direct replacements. This thanks to one of our best microwave detectives, Steve! MRC, Materials Research Corporation, merged a long time ago with MIC technologies in Texas, which then got bought by Aeroflex. In 2004, Aeroflex exited the thin film business, selling the Pearl River plant that was originally MRC to Vishay, a global conglomerate. At one time the Pearl River plant was the biggest supplier of polished 99% alumina substrates in the world. M/A-COM was sold by Tyco Electronics to Cobham in 2008. Good luck guys! The M/A-COM microwave window group was bought by CPI (Communications & Power Industries), Beverly Microwave group, which traces its roots to the Varian brothers. Thanks Dennis! "They were a spin-off of some guys from WJ and did mixers and converters etc. They were also bought by Remec and then merged into the C&S Hybrid that Remec also bought up and was the San Jose business unit. C&S Hybrid more or less disappeared as business dried up. Magnum product line was sold as part of the Wireless Access sales with QBit. One note the product drawings etc. that you mention regarding QBit. It was my understanding that most of the documentation, glass plates for masks etc. all got dumped. I know the two guys who helped with the accounting and move of the material from Magnum-C&S Hybrid after the sale. Almost nothing of the technology remained as it was being divested. All the old Magnum guys split up and blew to the winds." There was more but our legal council advised us not to print it! Magnum Semiconductor was acquired by GigOptix in April 2016, and renamed GigPeak. Thanks to Douglas for keeping us posted! MDC (Microwave Development Corp.) was bought by Chelton in 2005 as was Continental Microwave and Tool, and their two product lines will be merged somewhere in New Hampshire. MDI is now part of Herley. MDT (a GaAs house) was acquired by MicroSemi. GunnBloke wishes "good luck to them and even more to their customers." Melabs: this info came from ex-employee Norm. One of the original isolator companies from the 50's, Melabs was sold in 1969 to Smith Corona Marchant, SCM, the typewriter company. They sold the isolator division to M/A-COM several years later. MELABS was in Palo Alto between Varian Associates and HP. IntraDyne Systems, the guys spun out of Melabs in 1968, that died in 1970. Melabs also was in the spook business. They made receivers with IMPATT Diodes that were set up along the Turkish border with the USSR. They were located across the street from Watkins Johnson. Most of the talent at Melabs left to be in the Fairchild Microwave Products group in Mountain View. Merrimac Industries became part of Crane A&E in 2010. MICA Microwave was acquired by Micronetics in 2007, which is now owned by Mercury Systems. Thanks to Joe! MicroMetrics was founded in 1986 by Cy Morgan and his son Jim Morgan. Robert Fallon, Ernest Joly and Izola Magoon were principle investors and technical support. The company expanded in 1995 with the addition of Frederic Gilligan and Donna Langan who's ownership grew the company to over 11 million. The company was sold in 2007 to Aeroflex Corporation for 12 million. Aeroflex sold to Cobham in 2014 and in December of 2015 M/A-Com acquired and later consolidated the company into its Lowell Massachusetts facility. SemiGen (Semi-General, Inc.) was founded in 2009 by Jim Morgan, former founder of MicroMetrics. Microwave Associates was original name of M/A-COM, the microwave supplier known for the best parties at symposiums. This info on the founding fathers came from Brian and Chuck (thanks guys!) The company was started in August 1950 by four engineers, Vessarios Chiga, Louis Roberts, Hugh Wainwright, and Richard M. Walker. Their work grew out of development work that some of them carried out at MIT Radiation Laboratory during the Second World War. Richard M. Walker was a Kansas native who graduated in 1943 from the University of Kansas. The GaAs semiconductor building in Lowell Massachusetts is named "The Walker Building" after Richard Walker. Micronetics is now part of Mercury Systems. Microwave Design & Manufacturing Inc. of Calabasas California has been part of Rantec Microwave since 2000. Microwave Specialty Corporation was merged into Rantec Microwave Systems in 2002. Remember Microwave Power Devices (MPD) on Long Island, NY? Bought by Ericsson for $110 million in 2000. Ericsson sold off the military part to Comtech, got rid of most of most of the talent, then sold the remains to Powerwave for $10 million three years later. Thanks for the info from an ex-MPD guy! Update from another Powerwave alumnus: Powerwave sold off all the big machinery and closed the NY office in June, 2004, which killed off any vestige of MPD/Ericsson. Microwave Semiconductor Corporation (MSC) made state-of-the-art discrete GaAs FETs in New Jersey in the 70's and 80's. Founded by Ron Rosenzweig, MSC was eventually bought out by Siemens. MSC had a large facility in Billerica Massachusetts on Executive Park Drive that they acquired from Crown Microwave, which was sold to SDI after Siemens took over all of MSC. See Scientific Devices Incorporated below. The MSC guys mostly stayed on through Siemens and SDI. It sounds like they all jumped ship after the M/A COM acquisition. Some of them went to Frequency Sources. The MSC/SDI facilities in Billerica made diodes, microwave switches and limiters. As far as I know there aren't any remains of MSC/SDI Billerica. I don’t know of any ties to Cobham. Thanks to Tom! Microwave Semiconductor Corporation (MSC) product line was sold to Thompson CSF in Montgomeryville, PA which combined their product lines. Thompson subsequently exited the business but employees at the PA site managed to sell the operation to Microsemi. The group then was sold to Advanced Power Technology (APT) in Bend, OR who had just acquired competitor GHz Technology. APT closed the PA facility and moved about 5% of the products to Bend. APT was subsequently sold to Microsemi, who has no idea what to do with it. Microsemi's RF/microwave transistor product line now consists of some old products from CTC, MSC, Thompson, Acrian, APT and GHz. Also thanks to Lyle. And, according to Douglas, Microsemi’s defense and security business was sold to Mercury Systems in May 2016. The business unit includes products from Endgate, Milliwave, Endwave, JCA, AML, and ALC. Microsonics is listed on the Crane A&E site as a "heritage brand". Microwave Solutions, Inc. of National City, California, could possibly be considered another "spin-off" of Avantek and then later of Amplica... MSI was founded by Edward Teyssier who worked at Avantek from 1977-79 and then at Amplica, starting in 1979 before leaving in 1984 to found Microwave Solutions, Inc.
MIC Technologies was part of Aeroflex, now whatever is left of it is part of Vishay. Midwest Microwave in Saline, MI was purchased by Bevin V. Cherot in the early 90's. Midwest designed and developed the full range of microwave connectors and microwave components to match Americon/Omni-Spectra/M/A-COM designs along with custom designs primarily for military applications. Emerson Connectivity Solutions, a division of Emerson Electric, purchased Midwest Microwave in 2004. Operations were relocated to Waseca, MN in 2008. In 2014, Emerson sold that division to Bel Fuse, Inc, with their Cinch Connectivity Solutions Group. You can find Midwest Microwave components within the product pages of this group, such as Midwest terminations. Thanks the tip, Ken! John O’Campo’s investment vehicle GaAs Labs (http://www.gaaslabs.com/aboutus.htm ) purchased Mimix Broadband a couple of years ago and then went on to purchase the microwave components part of M/A-COM (with Cobham buying the rest). Last year the two were merged and then re-branded as M/A-COM Technology Solutions, which includes the following subsidiary companies: Mimix Broadband, Inc., M/A-COM Tech Asia, Inc., and M/ACOM Technology Solutions (Cork) Limited. Also M/A-COM recently sold off their ferrite business line (I’ve been told it was bought by Trak). Thanks to Liam! In January 2015, Miteq was acquired by L3 Communications for $41M, joining L3-Com's the recent acquisition of Narda East. Millitech, in Deerfield Massachusetts, is part of Smiths Microwave. Murata Erie has shortened their name to Murata. The Murata Manufacturing Company had purchased a company in Trenton Ontario named Erie and part of the purchase agreement was that they kept the Erie name. But Murata Erie in Trenton has been closed for years, and now their name is gone too. Mustang Technologies is now part of L3Com. Narda was bought by L3Com, but the name has been preserved. In June 2012 Nitronex announced that they were acquired by GaAs Labs LLC. GaAs Labs is a private company owned by John Ocampo, who at one point owned parts of MIMIX Broadband and M/A-COM. Those two were merged and into M/A-COM Technology Solutions and spun out as a public company earlier in 2012. The microwave portion of Nurad was sold off to NSI. This tip thanks to Sonny! This update from Bruce: Nurad was purchased by Chelton Microwave (a holding company that is part of Cobham PLC) in 1997. This business unit then purchased the Transco antenna line (still available for the most part). Then Chelton rolled this (and others) into Cobham PLC. Nurad (dba Cobham Sensor Systems) is still located in Baltimore, with many of the same people. It has the legacy antennas and radomes on many existing airborne, sea and ground based platforms as well as newly developed products. Ocean Microwave (a New Jersey ferrite isolator/circulator company) became part of Anaren in 2000. Not to be confused with Ocean Microwave, founded in 2000 in Beijing China. Was that a major coincidence or what? Omega Microwave was bought by STC Microwave Systems, a part of Crane Corporation since 2003. Olektron was sold to Signal Technology Corp, which became STC Microwave Systems when it was bought by Crane Co. Thanks to Ralph! Update August 2010: Here's good news, Omni Spectra is back! This correction is thanks to Darryl of XMA... "XMA", is that a play on words? "Ex-Microwave Associates?" We at XMA Corporation disagree with Omni Spectra being gone as we purchased many of the Passive Coaxial Components from Tyco after they had shut it down for a couple years to look for a buyer. We are that buyer (purchased in 2003) and the owners of the drawings, equipment, tooling, and much more that was Omni Spectra in Merrimack, NH years ago. We hold the trademark on the Omni Spectra brand/name too – not just an imitator – we are Omni Spectra. Omni is fully up and running and if anyone is looking for one of the original part numbers we are making most of the components that Omni Spectra had originally. P&H Laboratories, the Simi Valley circulator and ferrite company named after Phyllis and Harold Saltzman (thanks for the correct spelling, KS!) is long gone but you can still view their catalog on the Renaissance web site. Renaissance Electronics purchased the assets of P & H Laboratories and MCCI Wireless in June 2003. They still manufacture most old P & H hardware to the P & H part number/drawings. Pamtech is alive and well, and here is their new web site, in case you were looking for them. Quite a few people have pointed this out to us, thanks everybody. Pamtech (named for "passive microwave technology) is located in Camarillo, California. The "boss" at Pamtech, George F. Grund III (grandfather of George F. Grund V), had this to say: "I started PAMTECH in March 1976. It was a spin off of E&M Labs of Westlake, Ca. after TRAK of Tampa, Fla. bought them. PAMTECH is still alive and well in Camarillo, Ca. We still do isolators and circulators 30 years later." Update May 2010: we are sad to report that George Grund III passed away on April 23, 2010 (St. Georges Day), in his sleep. Thanks to Chuck for the update, and Laura for the correct date. Update July 2010, thanks to Howard: Pamtech has now been acquired by Quinstar Inc., Torrance CA., who will carry on making those special Pamtech devices. Here's some notes on Penstock, contributed by Steve at RFMW who obviously knows his stuff about distributors! "Penstock, Inc. (a.k.a. : Pen-Stock; Peninsula Stocking Distributor-named for the San Francisco Peninsula-where they were located), was founded in the mid 1970’s by Bruce White, as a stocking distributor for the low cost leader, Mini-Circuits and the high cost leader Avantek. Penstock morphed into one of the largest RF and Microwave component distributors, acquiring Waltronic Sales and Sertek Sales. Waltronic Sales was one of the first stocking distributors for Omni-Spectra connectors in the early 1960’s. Avnet acquired Penstock in 1994 along with Penstock Engineering (a.k.a. : PSElect; which became Avnet MTS “Microwave Technical Solutions”- Sold to Teledyne Cougar in 2005). In 2003 Avnet jettisoned the RF & Microwave Group of former Penstock employees located in (South) San Jose, California. RFMW Ltd. was founded shortly thereafter, by former Penstock employees. RFMW Ltd. headquarters are located around the corner from the empty Avnet MTS “Microwave Technical Solutions” building. Waltronic Sales; founded in 1962 was one of the first reps and distributor for Omni-Spectra connectors was Acquired by Penstock in 1988." Phase Matrix was bought by National Instruments in 2011. Phase One Microwave went out of business sometime in the late 2000s, but appears to have now reemerged as Wright Technologies in Roseville, CA. Thanks to JS! Phoenix Microwave of Telford, PA was bought by Stellex Microwave who was bought by Tyco and at last report was spun off to M/A-COM. Thanks, Daniel! Plano Microwave, spin off of UTL was bought by Sierra Nevada Corp in October 2002. Plessey Microwave was purchased by Stratex in 2003. Thanks, Bruce! Premier Microwave is part of Cobham DES. All locations remain physically where they were located before acquisitions. Q-bit parts are (for the most part) still available, as are the parts from the other divisions. Thanks to Mary who has worked at Q-Bit, Remec Q-bit, and now Spectrum Microwave! Radian Technologies is part of Spectrum Microwave. Radiotronix was acquired by Linx Technologies in March 2012. RAMAR Communications was another spin-off of Amplica. Mark Killian founded RAMAR around about 1985. Thanks to Edward! As of September 18, 2014, RF Micro Devices, Inc. and TriQuint Semiconductor, Inc. revealed that the holding company under which the companies will combine in a "merger of equals" will be named Qorvo™, Inc.
RF Nitro became part of RF Micro Devices, which is now Qorvo. amps and mixers along with associated products. It started in Farmingdale New York in 1960, relocated to Deer Park New York some time after 1970 when they needed larger facilities. The "R" was for Arnold Rubin, the "H" was for Ron Hirsch, and Robert E. Gruber was the "G" in RGH. Don Neuf was one of their senior engineers (now with Miteq along with Dave Krauthheimer and Bob Yurokso). Rockwell International became Conexant, which spun off the GaAs (Newbury Park) portion of the fab to Skyworks (previously Alpha Industries) and the other fabs became Jazz Semiconductor. Rockwell Scientific is now part of Teledyne. Check out Rockwell Automation's 1997 video on the Retro Encabulator. The turbo-encabulator was first proposed by John Hellins Quick in 1944. For a time it was offered as a product by General Electric. Rohm and Haas Electronics Materials in Blacksburg VA invented a batch-manufacturing process for printing miniature 3-D coax interconnects with air dielectric and low-loss copper, under the DARPA 3D-MERFS Program. DOW Chemical bought the Rohm and Haas company in 2008, but the PolyStrata process is alive and well at spin-off Nuvotronics in Radford VA and Durham NC, thanks to serial entrepreneurs David Sherrer and Noel Heiks. Sage, the company that has roots way back to the RadLab and WWII, was retired as a nameplate by Filtronic, around December 2005. More recently (2007) Sage has been rumored to have been sold again, this time to TRU corporation. Wait, here the (2011) latest: what was once Sage is now Spectrum Microwave's Nashua Operation! Thanks to Bob for clearing this up! Salisbury Engineering (Delmar, Delaware) is part of Spectrum Microwave. Sanders Associates was bought by Lockheed, at the time the were closing their Electronics division in New Jersey (now a Wal Mart? ), then sold to BAE Systems. SDI was a manufacturer of silicon diodes and solid state switches and was owned by John Caruso....most of the people ended up at Frequency Sources semiconductor division which is now called Microsemi Microwave Products...John Caruso is now the president of this division. SDI started out as Crown Microwave. They got hooked up with Microwave Semiconductor Corporation, later MSC was acquired by Siemens. After a while John and a couple of other management guys bought the Billerica group and named it Scientific Devices Inc. SDI got bought by Adams Russell who got bought by M/A-COM. Scrantom was acquired by Natel in 2003. Scrantom, located in Costa Mesa Cali, was (is) a player in LTCC technology, and we're glad they are still around! Semflex, a manufacturer of flexible microwave coaxial cable and custom cable assemblies based in Mesa, AZ, was purchased in 1994 by Sterling Holdings, owner of Trompeter Electronics. Sterling Holdings merged with Stratos Optical in 2003, and the consolidated business was purchased by Emerson Connectivity Solutions, a division of Emerson Electric, in 2007. Semflex is still co-located in Mesa, AZ with Trompeter Electronics. Thanks, Brian! Sierra Microwave started out in Sacramento in 1984 making circulators, isolators, filters, pin diode components and amplifiers, they are now owned by HEICO, located in Georgetown, Texas and still trading but they ditched the amplifier line before moving. Thanks to Brian! That amplifiers that were ditched were key to the formation of Milliwave as previously mentioned under Avantek. Thanks to Fritz! SiGe was bought out by Skyworks in 2011. Signal Technology became part of Crane A&E in 2003. Silicon Wave (San Diego Sorrento Valley area) was sold to RF Microwave Devices (RFMD). Many of the engineering team spread out to Staccato Communication, RF Magic, Quorum Systems, MaxLinear and Sequoia Communications. Lots of cross breading in RFIC world. Thanks to JC! Sirenza is now RFMD (thanks for pointing this out, Nick!) Sirenza was originally called Stanford (the name change was due to a lawsuit with the "real" Stanford.) Founder John Ocampo later used his considerable cash to pull together MIMIX broadband and one of the original pieces of M/A-COM (the Lowell plant). You'd think once you have a couple hundred million it might be time to lay back on the beach, but we admire the cojones this took. For those of you trying to keep track, Smiths Interconnect now owns Kaelus, RadioWaves, PolyPhaser, Transtector, TECOM, TRAK, LORCH, TRAK Limited, Millitech, EMC Technology and Florida RF Labs. Also Hypertac and IDI. Spectrum Microwave's catalog brags that they are made up of all these: Spectrum Microwave. Combining the people, products and technologies from FSY Microwave, Salisbury Engineering, Q-Bit, Magnum Microwave, Radian Technologies and Amplifonix into a single operation .... Thanks to Jake! Sperry has a long history, starting with gyroscopes in 1910. Among many other things, they designed the ball turret for the B17 Flying Fortress bomber in WWII, memorialized in a poem by Randall Jarrell. Sperry Corp was the subject of a hostile takeover b(in 1986) y Burroughs and formed a new company called Unisys. Within a very short period of time, the Sperry Microwave facility in Clearwater was sold to Hercules Defense Electronics Systems, Inc…. not sure what became of the facility since then…..looked it up on google and it looks like the building is empty and for sale…. This info on Sperry Microwave/Gyroscope from Pete... Thanks! My father worked for Sperry Gyroscope for 35 years. By the late 80s, they had moved their plant from Oldsmar, FL to Clearwater. By then, I think they had already sold it to Unisys, who operated it for a short time. Ultimately, when he retired in the early 90's, I don't remember exactly when, it had already been sold to Hercules for several years. Hercules was, or is, primarily a manufacturer of explosives. Since he worked mostly in defense, I'm not entirely sure what they did at the Clearwater plant, but I definitely remember him retiring from Hercules. Sperry Microwave in Gainesville, Florida shut down in the late 60s or early 70s. In the late 70s and early 80s I worked with one of the engineers that had moved from Gainesville to worked at the "new" Sperry Microwave facility in Clearwater, Florida. Sperry Microwave in Clearwater did shipboard radar systems in association with Sperry Gyroscope out of Great Neck, NY. In the mid 80s Sperry Clearwater was bought out by an electronics company whose name escapes me. STC Microwave Systems, formally Signal Technology Corporation Arizona and California Operations, has been designing and manufacturing custom Microwave Components, Oscillators and Subsystem products for the more than 30 years and has grown to become the premier designer and manufacturer with its Microwave Integrated Multi-Function Assembly (MFA) products. We are recognized as a market leader in Custom Microwave Products and Services. Hey, how did that marketing jive end up on THIS page? STS (Satellite Transmission Systems) is also part of L3-Narda in Hauppauge, NY. Thanks again, Marian! Stellex is now part of M/A-COM, which is part of Tyco. Like any happy corporate family, the M/A-COM east coast and west coast microwave hybrid houses enjoy some sibling rivalry, even though there is no reason to close either one of them because they both stay very busy. Stratex was purchased by Harris in 2005. Harris Stratex later became Aviat. Thanks again, Bruce! Sumitomo Electric is now part of Eudyna. Switchline went to K&L Microwave. Thanks to Jake! Systron Donner was bought by STC Microwave Systems, a part of Crane Corporation since 2003. I worked there, they were a Grumman (pre-Northrop) subsidiary, in Plainsboro, NJ, and they did indeed disappear into thin air. The fab equipment was sold off or transferred to Grumman's fab activity; the RF test stuff went to Grumman as well. Ray Pengelly, (Microwave Hall of Fame) was there and was my Director of Engineering, and several of us including me, mostly MSC alumni, ended up at Anadigics eventually. Ray went to work for Ulrich Rohde (and somewhere else later, I think) and wound up at Cree, from which he has recently retired. Ray and I still keep in touch. Anadigics is still limping along... they recently announce they were going to be acquired by John Ocampo's GaAs Labs but that has not been finalized. TECOM Industries, the SatCom company in Thousand Oaks California, remains a brand but is part of Smiths Microwave. Texas Instruments: the Defense Systems Equipment Group was sold to Raytheon, the GaAs chip house became part of TriQuint, but the cowboy silicon importers of Dallas still call themselves TI. Thunderline Z, makers of hermetic packages and feedthroughs in New Hampshire, became part of Fusite, which is now part of Emerson. Maybe someone cam fill us in on the details? Trak Microwave, makers of isolators and circulators in Tampa Florida, still exists as a brand but is now part of Smiths Microwave. Transco Products, Inc. (Camarillo, CA) merged with Datron (that's "Datron", not "Daytron", thanks to Rohit!) Please note that Transco/Datron became Datron Advanced Technologies in 2001, which was further acquired by L-3 Communications in 2005. Regarding the coax and waveguide switch side of the Transco Products, Inc. history, here's the history as far as I know. Transco started in 1942 and by the early 1970's were based in Venice CA, very close to Marina Del Rey. In the late 70's they moved to Camarillo CA and become Datron/Transco Inc. The switch line was then acquired by K&L Microwave and by the mid 1990's K&L/Transco acquired Dow-Key Microwave. However, Dover Corporation, the ultimate holding company recognized that Dow-Key Microwave had by far the strongest position in the switch market and all production was transferred to the Dow-Key facility in Ventura around 1996. Today (2010) Dow-Key remains part of the Dover Ceramic & Microwave Products CMP group. Triangle Microwave, (East Hanover, NJ), was bought by KDI which later became partners with Aeroflex. Thanks to Barry the Limo Guy! As of September 18, 2014, TriQuint Semiconductor, Inc. and RF Micro Devices, Inc. revealed that the holding company under which the companies will combine in a "merger of equals" will be named Qorvo™, Inc.
TRW Microwave started out as Aertech Industries (founders were Fred Schumacher and Harold Harrison), and later bought by TRW in the 1974. Thanks to Tom! Here is a site created by Brooke Clark that gives a detailed history of Aertech. TRW Microwave was sold to Frequency Electronics in Mitchell Field NY in the late 80s or early 90s. FEI changed their name to FEI Microwave. Thanks to Nick! TRW's GaAs foundry became Velocium, which was bought by Northrop Grumman. TRW RF Semiconductors in Lawndale: TRW Semiconductors was sold to Motorola when Methusela was a baby. Site is now a hotel and Western Federal Credit Union. Thanks, Melissa! TRW Microwave is long gone, but not the superfund site they left behind in Sunnyvale California. The name TRW comes from the 1958 merger of Thompson Products and Ramo-Wooldridge. TRW followed the "ITT model" of rapid expansion, getting caught cheating on military contracts, polluting ground water and putting employees at danger, then finally retrenchment into obscurity. In addition to credit reporting, TRW produces automotive air bags, another dual opportunity for OSHA violations and site pollution due to highly toxic sodium azide that is used to inflate the bag. PIN diode manufacturer Unitrode (Watertown MA) was bought by MicroSemi years ago. Thanks to Ralph! US Monolithics is now Viasat Advanced Microwave Products. Thanks to John! Varian is now Communication and Power Industries Inc. (CPII). The M/A-COM radar products group that was bought by Varian is now also part of CPII. Varian Microwave ( Beverly, MA ) was bought by STMicroelectronics. Varian Solid State is now part of Crane A&E. Vari-L was Enron in miniature... except that in Vari-L's case nobody served a day in jail, or paid any significant fine. Thanks to Meyer for supplying the Vari-L history! Vectronics Microwave Corporation was acquired by Micronetics. Velocium was never really acquired by Hittite, but ut seemed that way, as some of these parts merged into the Hittite catalog. Hittite acquired the rights to stock inventory, market and distribute the Velocium product line up to 86 GHz. Products that work above 86 GHz are still sold directly by NGC Velocium. Thanks, Fritz! VT Silicon of Atlanta Georgia has been part of Microsemi since 2010. Where is Warnecke Electron Tubes, Inc. formerly in Des Plaines Illinois? Or for that matter, where were they then? Not a whole lot about them. I have an ancient 3" CRT they made it so well-designed and executed I can't even guess the G-forces its guts could withstand. It seems to be a prototype for evaluating the gun structure that wound up in a scan convertor tube. Some connection to CSF on the other side of the pond. The connection of Warnecke to microwaves is that they (Robert Warnecke and staff) were heavily involved with crossed-field amplifiers, TWTs and the like. Northop bought Hallicrafters and Warnecke Electron Tubes and created the Defensive Systems Division in Rolling Meadows, IL. That group operated as Northrop Electron Tube Systems (NETS) for a number of years. We are still making TWT amplifiers at the Rolling Meadows IL campus, currently called the Land Forces and Self-Protection Systems Division of the Northrop Grumman Electronic Systems Division. Watkins Johnson microwave components was sold to Stellex, another piece of WJ became part of Endwave. Stellex declared bankruptcy around year 2000, and was sold to Tyco (M/A-Com). WJ Communications carries on the name, and owns all of those great app notes you wished you'd saved! Update March 2008: TriQuint acquired what was left of Watkins Johnson's MMIC line. Part numbers starting with AG and EC (DC-6 GHz HBT amplifers) are the legacy WJ products. WaveBand was acquired by Sierra Nevada Corporation in May 2005. WaveCom of Saskatchewan changed names to VCom, awhile back. This just in from Karl: WaveCom (FSCM28979, thanks to Lee for the correction!) became part of Loral, now L-3 Communications, Narda West CAGE 60583. Webb Ferrite was formed in the 1950s by Bob Webb, who sold out to Farinon Electric in 1977. Harris Corporation purchased Farinon in 1981, but the original ferrite business was sold out to M2 Global in 1999. Weinschel is part of Aeroflex. Western Microwave was bought by STC Microwave Systems, a part of Crane Corporation since 2003. Around 1990 or 1991, when Western was going down fast, Ferenc Marki took his Mixer expertise and formed Marki Microwave. A quick web search shows that Ferenc and son are still around. 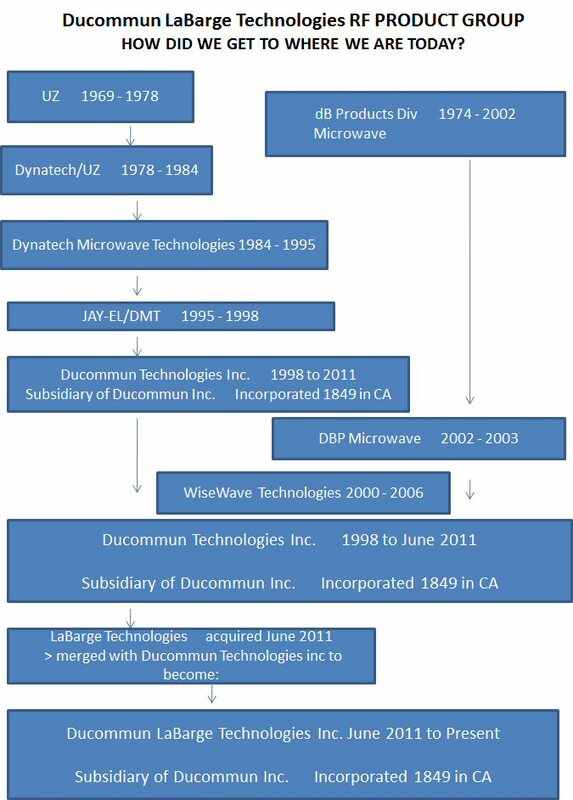 WiseWave was acquired by Ducommun. Thanks to GunnBloke! This came from John: Here is a follow up to WiseWave: Yonghui Shu, the owner who sold the company to Ducommun, has re-started the company as Sage Millimeter. I haven’t checked to see if they make all of the same products, but interestingly, it is at the same address as the old WiseWave. YIG-TEK was bought by Signal Technology. Zeta Laboratories Inc. of Santa Clara, California is now DRS Technologies (DRS Signal Solutions - West) in Morgan Hill, Ca. Thanks, Steve from White Sands!